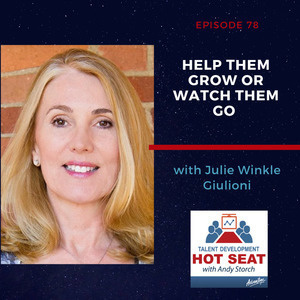 On her book "Help Them Grow Or Watch Them Go"
Dominick Quartuccio is an international speaker, author, mentor, and veteran of the healthcare, insurance, and financial services industries. He is also a corporate trainer. After 15 years rising the ranks in the corporate world, Dominick left to start his own coaching and speaking business. 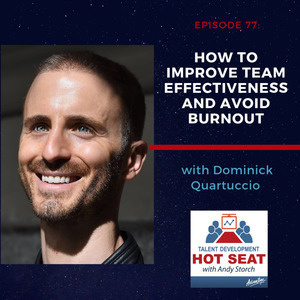 Today, Dominick works with clients to raise individual and team performance while short circuiting burnout. He likes to challenge conventional thinking, unlock previously hidden potential and develop talented people at all stages of their career journey. He is also the author of the bestselling book “Design Your Future: 3 Simple Steps to Stop Drifting and Start Living” which hit #1 on Amazon in Business Skills and Organizational Change. 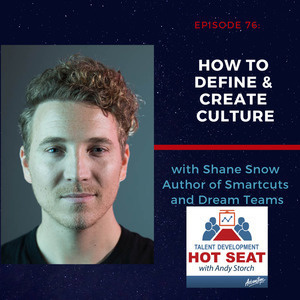 In today's episode of Talent Development Hot Seat, Andy interviews Shane Snow, a journalist, entrepreneur, and bestselling author of the books Smartcuts, The Storytelling Edge, and Dream Teams. In this interview, we discuss how he became a unique storyteller, diversity, cross-culture merging, and many more. Tune in now and enjoy the show! 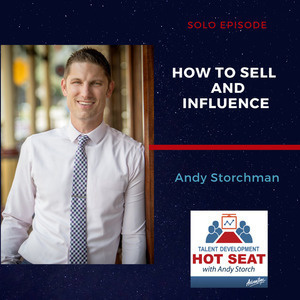 Do you ever wonder how you could or should go about selling or influencing others, especially with no sales experience? 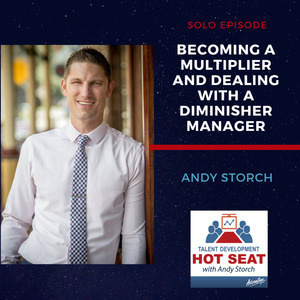 Today I'm answering a question from one of my listeners about how to sell when you have no sales experience. Larry is a strategic senior leader in global HR management, with proven success with multibillion dollar businesses such as Equinix, Citibank and Philips Electronics, as well as dynamic software companies like TIBCO Software and Glu Mobile, to deliver highly effective talent management and organizational development strategies. Currently Larry is the Vice President of Global Talent at NetApp, an IT Services company that provides a full range of hybrid cloud data services with $6B in revenue and over 10k employees. In this newly created global talent role, Larry is focused on ensuring the people strategy closely aligns with the business strategy. Today I have a personal update on my life and business after attending Social Media Marketing World in San Diego. 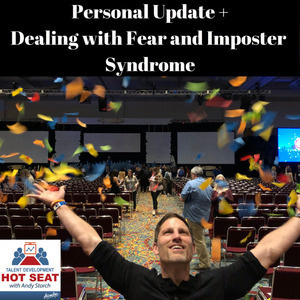 I also want to talk about how fear and imposter syndrome hold people back and how to think about those things. 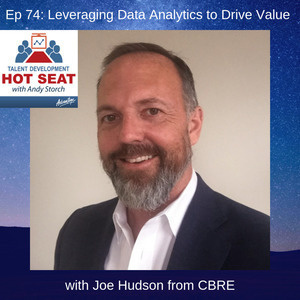 In today’s episode, Andy interviewed Joe Hudson. Joe is the Senior Vice President of Human Resources. He is responsible for supporting the global advisory services line of business at CBRE, a Fortune 500 company and the world's largest commercial real estate services and investment firm with more than 80,000 employees. He joined CBRE in 2006 and has served in management positions with increasing responsibility, including directing HR operations, serving as Vice President of Human Resources for the company, for the employees in CBRE’s brokerage, capital markets, valuation/appraisal and shared services divisions. Before becoming SPP for CBRE's global operations, Joe is an executive member of the HR Global Leadership team which is made up of the most senior HR leaders in the organisation, responsible for setting and driving HR strategy across the enterprise. Joe is based in Dallas, Texas. 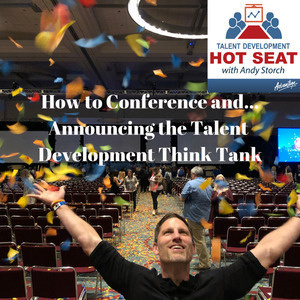 In today's solo episode, I talK about how to get the most out of conferences and why I'm starting my own conference, the Talent Development Think Tank. In today’s episode, Andy interviewed Teri Hart. Teri is an experienced learning leader with proven ability to leverage deep learning expertise and strategic thought leadership to develop people and transform organizations. She is known for her ability to formulate organization-wide training and development strategy, collaborate to gain buy-in, and thoughtfully align people and processes to deliver on the strategy—with the aim of helping organizations extract competitive advantage through the capabilities of their people. 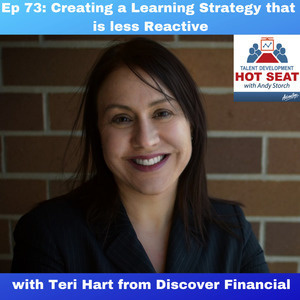 Currently, Teri is the Chief Learning Strategist and People Development Leader at Discover Financial Services.